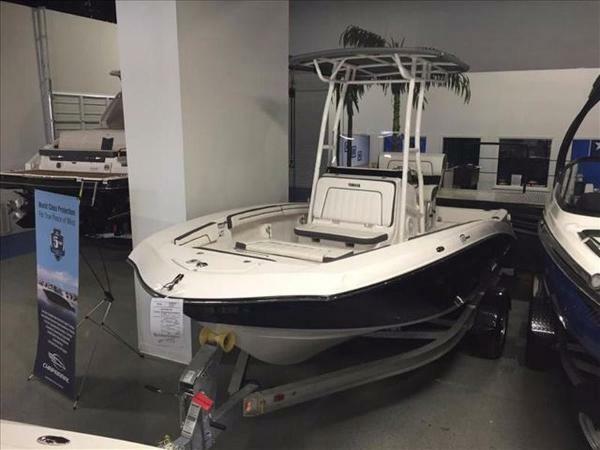 2017 Yamaha Marine 190 FSH Sport 2017 Yamaha Marine 190 FSH Features may include: T-Top Exclusive to the Sport model, the T-top provides shade and style yet is easily removable for garage storage. Helm The FSH helm was designed for customization so every boat fits its owner. Leaning Post With a convertible backrest on Sport and Deluxe models, the leaning post works as both the captain's spot or the perfect fishing spot. Lockable Helm Storage Plenty of storage options including a lockable glovebox as well as a 12V outlet, USB and auxiliary plug-in. Lockable Console Storage This large area ideal for changing or head storage comes with a curtain in the Sport and Deluxe models. Side Console Rod Storage Standard on all models, the side console rod storage keeps fishing rods ready at all times. 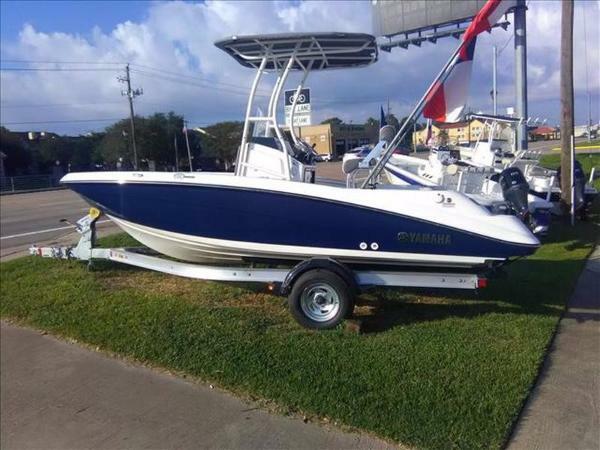 2017 Yamaha Marine 190 FSH Sport 2017 Yamaha Marine 190 FSH Sport Features may include: T-Top Exclusive to the Sport model, the T-top provides shade and style yet is easily removable for garage storage. Helm The FSH helm was designed for customization so every boat fits its owner. 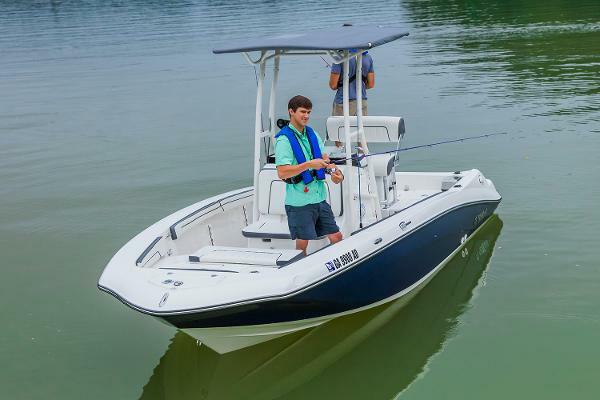 Leaning Post With a convertible backrest on Sport and Deluxe models, the leaning post works as both the captain's spot or the perfect fishing spot. Lockable Helm Storage Plenty of storage options including a lockable glovebox as well as a 12V outlet, USB and auxiliary plug-in. Lockable Console Storage This large area ideal for changing or head storage comes with a curtain in the Sport and Deluxe models. Side Console Rod Storage Standard on all models, the side console rod storage keeps fishing rods ready at all times. 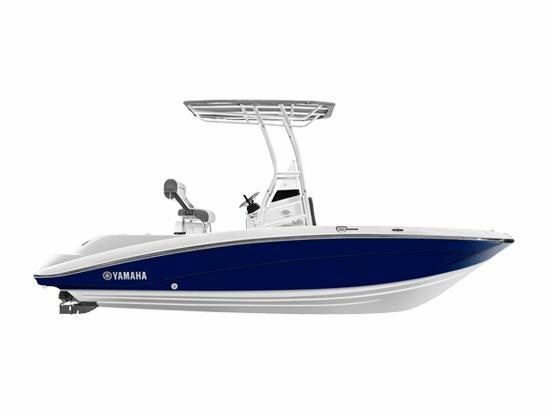 2016 Yamaha Sport Boat 190 FSH SPORT Top of the line model featuring a T-top over the center console. 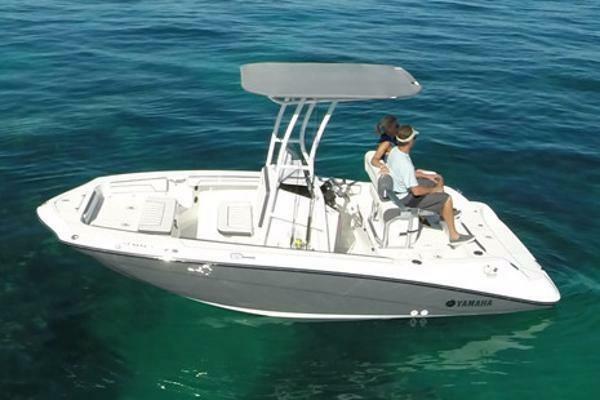 Put yourself in the center of Yamahas one-of-a-kind, fishing-friendly center console boat. The compact design of Yamahas internal jet propulsion system results in an open, cross-functional platform with 360 degree access to the water. With its 16 inch draft, shallow water navigation is a breeze in coastal and inland conditions. 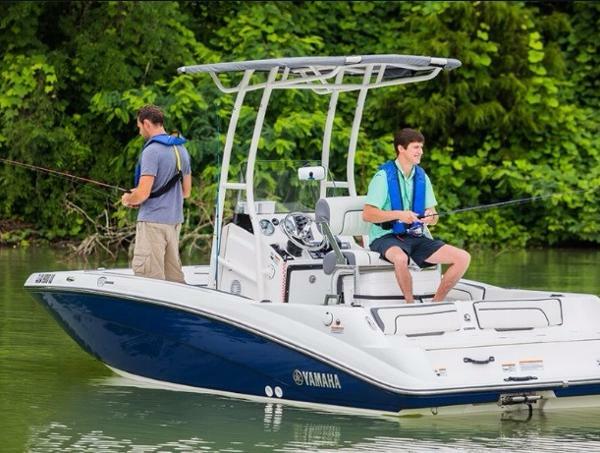 The family-friendly layout is packed with Yamaha-exclusive technology, plus key features for fishing including plenty of storage for rods, bait, tackle boxes, coolers and anchors. 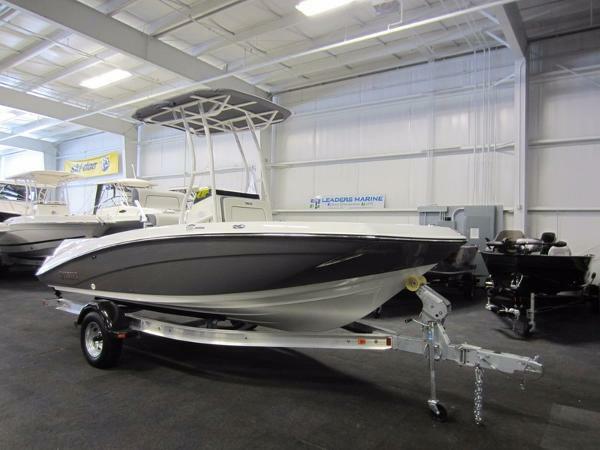 Comes standard with T-top tower and Bimini at no extra charge. - SPRING SPECIAL!!! 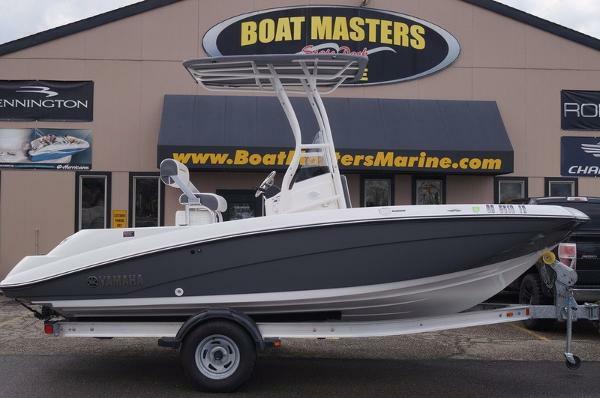 2017 Yamaha 190 FSH Sport SPRING SPECIAL!!! 2016 Yamaha 190 FSH Sport 2016 Yamaha 190 FSH Sport Put yourself in the center of Yamaha’s one-of-a-kind, fishing-friendly center console boat. 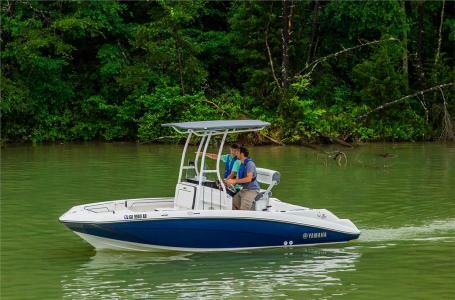 The compact design of Yamaha’s internal jet propulsion system results in an open, cross-functional platform with 360 degree access to the water. With its 16” draft, shallow water navigation is a breeze in coastal and inland conditions. 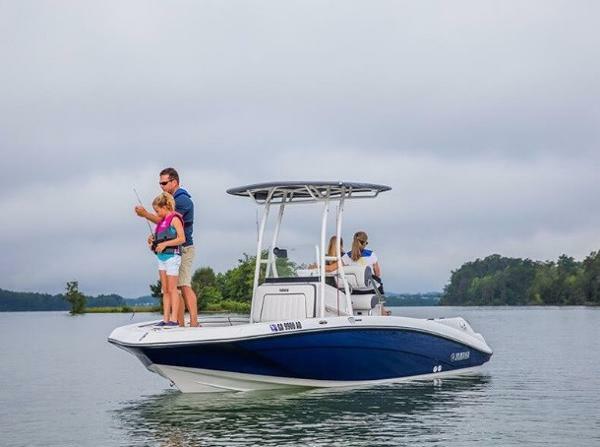 The family-friendly layout is packed with Yamaha-exclusive technology, plus key features for fishing including plenty of storage for rods, bait, tackle boxes, coolers and anchors. 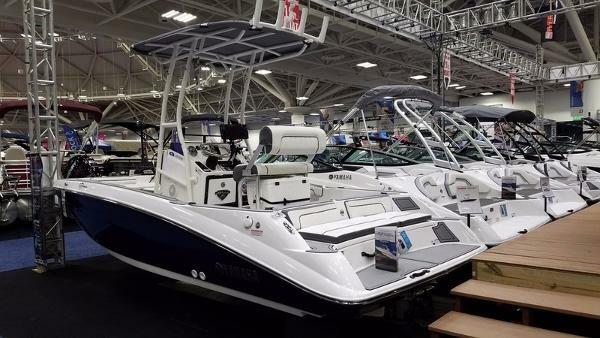 Comes standard with T-top tower and Bimini™ at no extra charge. * Exclusive to the Sport model, the T-top provides shade and style yet is easily removable for garage storage. * The FSH helm was designed for customization so every boat fits its owner. * With a convertible backrest on Sport and Deluxe models, the leaning post works as both the captain's spot or the perfect fishing spot. * Plenty of storage options including a lockable glovebox as well as a 12V outlet, USB and auxiliary plug-in. * This large area ideal for changing or head storage comes with a curtain in the Deluxe and Sport models. * Standard on all models, the side console rod storage keeps fishing rods ready at all times. CALL TODAY FOR OUR BEST PRICE! Item and price are good for a limited time or while supplies last and includes Leaders RPM's Preferred Customer Program (call for details). This is a BRAND NEW unit with full manufacturer’s warranty. Price includes dealer discounts PLUS any factory-to-dealer rebates. Competitive financing rates and terms are also available. Delivery is available and trades will be considered. Price is plus freight, prep, and sales tax/fees. Price is subject to availability and may change without notice. 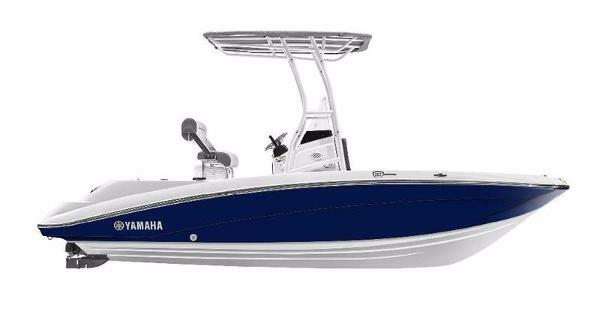 2017 Yamaha 190 FSH Sport The Yamaha 190 FSH Sport provides top of the line family fishing with a T-top. Some highlighted features included in this model are; central head compartment with curtain, T-top with removable canvas, convertible leaning post and dual battery set up.